Planted Aquaria (ISSN 1529-9228) is published quarterly for $20 per year by Planted Aquaria, 7 Gateview Court, San Francisco CA 94116-1941. Application to mail at Periodicals Postage Rates is pending at San Francisco CA. POSTMASTER: Send address changes to: Planted Aquaria, 7 Gateview Court, San Francisco CA 94116-1941. Subscriptions: $20/year $38/two years, add $8 per year outside USA. Planted Aquaria, Issue #2, Summer 2000 Copyright 2000, Dave Gomberg, All rights reserved No responsibility assumed for unsolicited submissions. If you wish your submission returned, enclose SASE. Well, we have both seen the first issue of Planted Aquaria Magazine. It was more than I had hoped for, but it was less too. I had hoped for great content, and we sure had that. But I had hoped for crystal-clear sparkling pictures, and they weren't as good as I had wished. The fault lies not with the photographers, who did great work, but with the processors. Once I can sort this out I will let you know more. The ads prove that the printer was doing his job. The issue's late appearance was due to a string of problems. The last of these was the mailer's failure to mail the copies. He had no excuse for this; he "lost the job". My partner and I ended up addressing, stuffing, stamping, and bulk-mailing the copies to you all. We did this overnight. The authors were fantastic. Karen Randall on styles in aquascaping and Neil Frank on chain swords offered serious content, while Steve Dixon's piece on Tom Barr gave us a glimpse of a name we see often on the Aquatic Plant Digest. Jay Lenahan took us inside the serious academic world of aquatic plant literature with a great extract of a long paper on submerse growth physiology. All in all, I give myself a C+ on the first issue. I hope the one you are holding now is at least a B+. We are all working hard to address the problems that made the first issue less than perfect. This month we feature a in-depth look at algae by Brad Metz and a thorough appraisal of substrates by Jamie Johnson. John Glaeser tells how he started a planted tank club. And there is a bit of humor from Lori Shimoda; great news of the promotion of Claus Christensen at Tropica, a firm friend of the hobby world-wide; news of the first planted aquarium workshop at Chattanooga this fall; and some bloopers from the first issue. Soon we will have a fine article on chemistry for planted aquarists, a feature on the genus Otocinclus, a look inside the Tennessee Aquarium and its huge planted tanks, as well as more features to keep you posted on the human side of our hobby. Now a word about the economics of a publication like this: it takes about 20 ads and 1,000 subscribers to break even at forty pages. With 24 ads and 1,500 subscribers, we could go to 48 pages. And with more ads and subscribers, we could have even more pages. I would like to have 64 pages, with 32 ads and 32 pages of editorial material. You can help this happen. Make sure all your planted tank friends know about the magazine. If they need to know how to subscribe, mention our website. Or tell me and I will let them know. Or get them started with a gift subscription. And talk to the vendors you respect. Tell them about the splendid opportunity our reasonably priced ads represent. Together we can make a good magazine great! Finally, I want to thank our patient subscribers. They suffered through the birth pangs of Planted Aquaria as much as anyone. And their perseverance is responsible for much of what you hold in your hands. 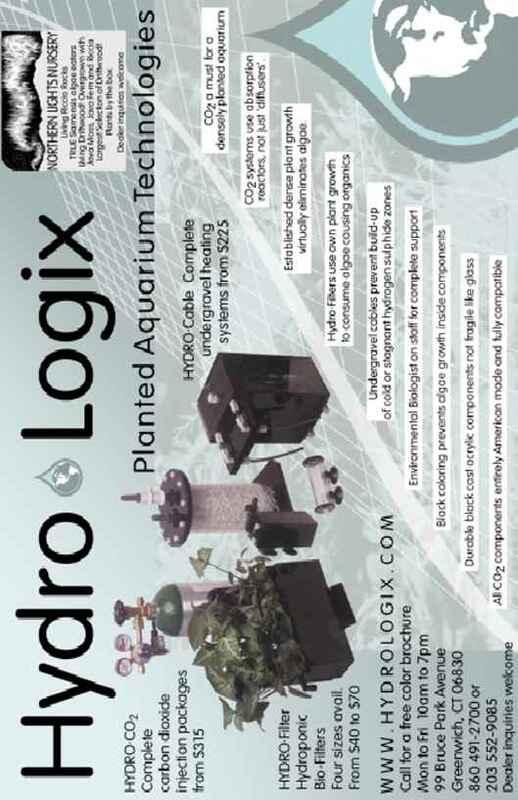 If you are not yet a subscriber, check out the info on the previous page and see how easy and inexpensive it is to get Planted Aquaria regularly in your mailbox. Have fun with your planted tank! 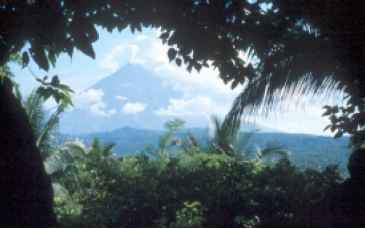 with view of the Mt. 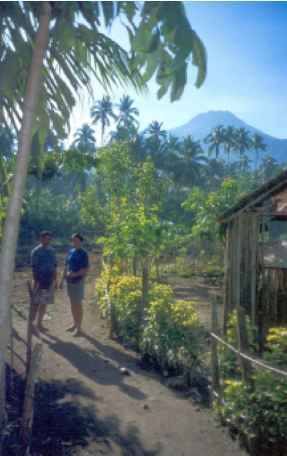 Bulosan volcano. Cryptocoryne aponogetifolia grows in several streams. This landscape is dominated by coconut palms. The strongly blistered, long-leaved Cryptocoryne aponogetifolia is a rather well-known aquarium plant. Hobbyists worldwide have cultivated this plant for many years. It is easy to grow and prefers hard water, is quite resistant to the feared "crypts-disease" and may develop luxurious foliage. Last year, I visited the Philippines to see the places it grows in nature. From the literature and herbarium studies these sites are well known, but I was glad to have a guide. Herson Morco from Morco International, Manila, accompanied me on the trip to southeast Luzon, where the plant grows in the Albay and Sorsogon provinces. The Morco firm has been involved for many years in shipping aquatic plants from the Philippines—not only Cryptocoryne aponogetifolia , but also Cryptocoryne pygmaea and the beautiful Cryptocoryne usteriana. The trip was a success; we found Cryptocoryne aponogetifolia at several localities. We must be a bit lucky, for these crypts grow in rather fast-running rivers and can be observed and collected only when the water level is low. 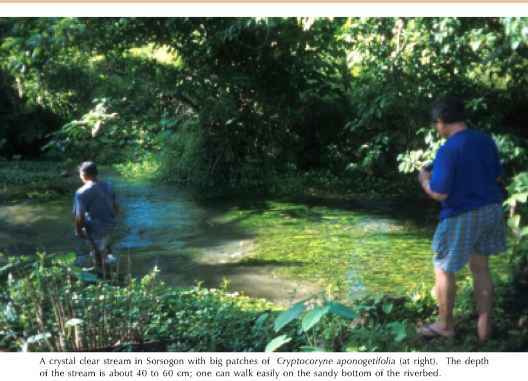 A crystal clear stream in Sorsogon with big patches of Cryptocoryne aponogetifolia (at right). The depth of the stream is about 40 to 60 cm; one can walk easily on the sandy bottom of the riverbed. them closely in the stream bed. In another river the water was very cloudy and deep, and we found the plants along the edges and on banks (even partly emersed because the water was extremely low). They are fully exposed to the sun at least a part of the day. The landscape is not a primary forest; the land along the rivers is used for low-intensity agriculture. But change to more intensive forms of agriculture would probably destroy Cryptocoryne aponogetifolia in a short time. Cryptocoryne aponogetifolia can grow tall, but the maximum size of about one meter long by 8 cm wide in nature is seldom seen in an aquarium. More often it is 50 to 60 cm long and 5 cm wide, depending on circumstances. The leaf blade is permanently deeply blistered in a couple of rows. Both the upper and lower side of the leaves are bright green, without any purple. A well grown specimen in a fish tank can have more than 10 leaves, the stems upright and the leaves spreading over the water surface. Though it is possible to grow Cryptocoryne aponogetifolia emersed in a pot (the plant does not then exceed 20 cm), for full development one has to use a tall aquarium. The water should be hard, as in the Philippines the plants grow between basalt rocks and in limestone areas. Another hard water crypt is Cryptocoryne affinis from West Malaysia; the two form a good couple to cultivate together in an aquarium. Lighting for Cryptocoryne aponogetifolia should not be too intense. 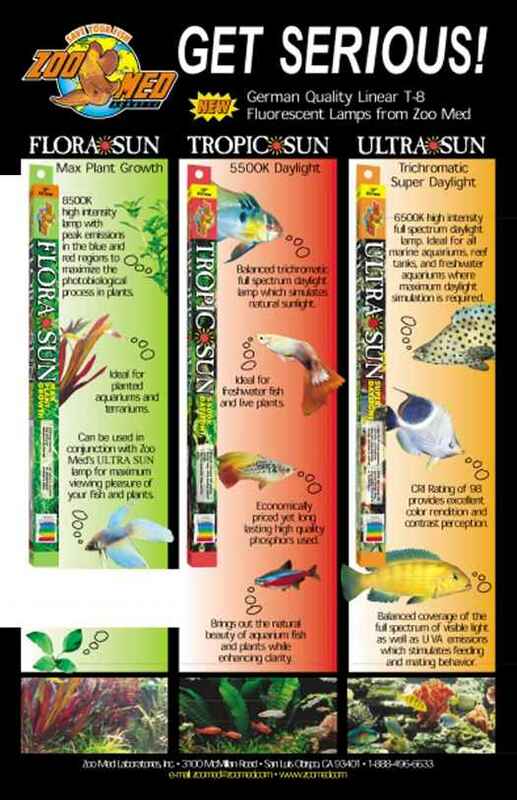 When using fluorescent tubes, don't use too many; two or three suffice for full-grown plants. Limb of the spathe of Cryptocoryne apono-getifolia. The plants in Sorsogon were flowering abundantly in May. 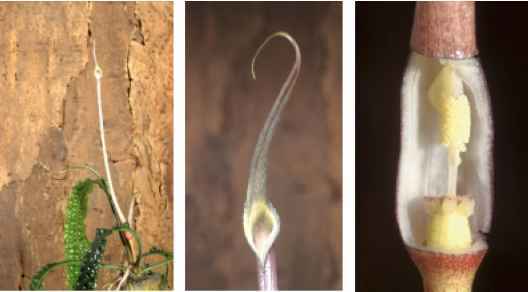 The spathe in Cryptocoryne apono-getifolia is a rather long tube, only the top emerging from the water. The very tiny flowers are down under the tube. Pollination is by small flies which enter the tube. Substrate presents no special problems. Normal aquarium gravel with some clay added will be fine. The name Cryptocoryne aponogetifolia means "the crypt with leaves like an Aponogeton". Aponogeton is another genus of aquatic plants and one of its species has similar foliage with strongly blistered leaves. There is little other similarity between the species. In botanic history, many authors had problems naming newly discovered plants, and this problem continues today. Until the 1980s most botanists believed that Cryptocoryne aponogetifolia was the same plant as Cryptocoryne usteriana. That name is often used for our plant. But it has been shown that Cryptocoryne usteriana is another plant, also from the Philippines, with broader leaves, less blistered, and an almost wine-red lower side of the leaves. My visit to the Philippines was a great adventure and I look forward to returning soon—perhaps to chase another of the elusive cryptocorynes. Cryptocoryne aponogetifolia. The whitish spathes reach half of the full length of the plant. The Morco firm has shipped these plants for over 25 years from a nearly natural farm, giving employment for a lot of people. Preparing dinner at sunset in Camalig, one had to choose among traditional foods. This was one of the most exciting experiences of the trip. View of the mighty Mayon volcano in Albay province (Luzon) from a limestone cave. In February 2000 there was a big eruption, causing the evacuation of the whole area. 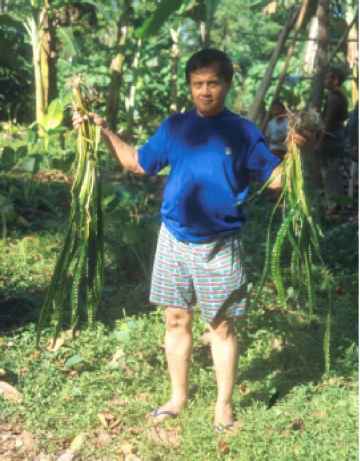 Cryptocoryne aponogetifolia grows in several streams in the surroundings. In the dry season, the water level is low. On the banks Cryptocoryne aponogetifolia grows emersed. The leaves are short and the rhizone is deeply buried in the stony soil. Cryptocoryne aponogetifolia in the Sorsogon province growing in slow running water. Photo by Josef Bogner. Cryptocoryne aponogetifolia. The leaves are as blistered as in nature, but much smaller. The rockwool substrate is only for 'high tech' cultures and is not recommended for hobbyists. cultivated Cryptocoryne aponogetifolia can vary from yellow to deep purple. A rather big river in the Albay province. The water level is very low. Despite this one could hardly 'walk through' the river because of the depth and the current. 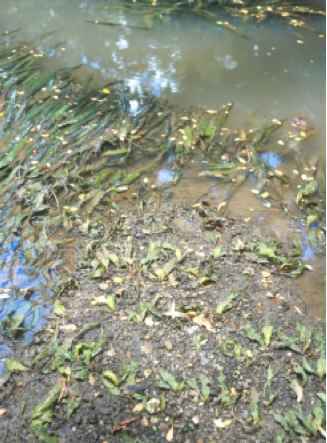 For miles, very big patches of Cryptocoryne aponogetifolia grow along the banks. Note the grayish water. Mark your calendars! The Aquatic Gardeners Association announces the first full weekend of activities for lovers of planted aquariums! Enjoy the fellowship of other aquarist interested in this fast-growing segment of the hobby while learning from some of the top aquatic gardening experts in the U.S. 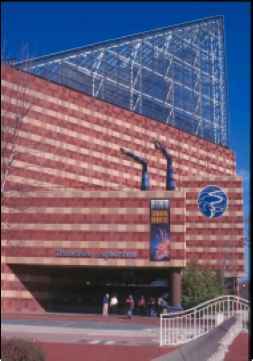 Explore the Tennessee Aquarium in the privacy of an exclusive after-hours tour, and experience the beauty of autumn in Tennessee while dining aboard a riverboat.